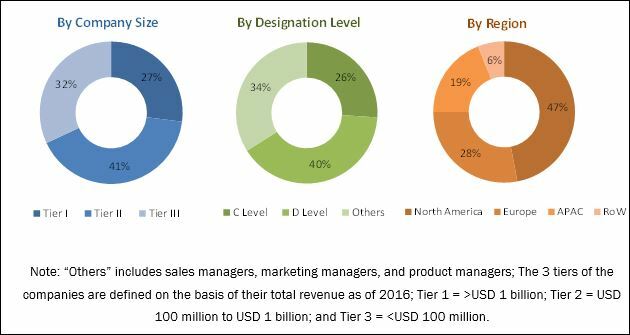 [210 Pages Report] The wireless data radio modem market was valued at USD 557.6 Million in 2017 and is expected to reach USD 724.1 Million by 2023, at a CAGR of 4.03% during the forecast period. The base year used for this study is 2017, and the forecast period is between 2018 and 2023. The research methodology used to estimate and forecast the wireless data radio modem equipment market begins with capturing data on key vendor revenues through secondary research. The secondary sources include Federal Communications Commission – Research Papers, European Telecommunications Standards Institute (ETSI) – Journals, Institute of Electrical and Electronics Engineers (IEEE) – Research Papers, and MarketsandMarkets Analysis. Moreover, the vendor offerings have been taken into consideration to determine the market segmentation. The bottom-up procedure has been employed to arrive at the size of the overall wireless data radio modem from the revenue of the key players in this market. After arriving at the overall market size, the total market has been split into several segments and subsegments, which have been verified through primary research by conducting extensive interviews with key experts such as CEOs, VPs, directors, and executives. The data triangulation and market breakdown procedures have been employed to complete the overall market engineering process and arrive at the exact statistics for all segments and subsegments. The breakdown of the profiles of primary respondents is depicted in the following figure. The wireless data radio modem market comprises following players: Intuicom (US), SATEL OY (Finland), Motorola Solutions (US), Schneider Electric (France), Digi International (US), Pacific Crest (US), Advantech B+B SmartWorx (US), FreeWave Technologies (US), Cohda Wireless (Australia), Campbell Scientific (US), Harris Corporation (US), Pro4 Wireless (Sweden), SIMREX Corporation (US), Wood & Douglas (UK), GE Grid Solutions (US), JAVAD GNSS (US), ABB (Switzerland), Harxon Corporation (China), Adeunis (France), ATIM Radiocommunications (France), Encom Wireless (Canada), Microhard Systems (Canada), and Arada Systems (US). To provide a holistic picture, the current market demand and forecasts have also been included in the report. The market segmentation is given below. 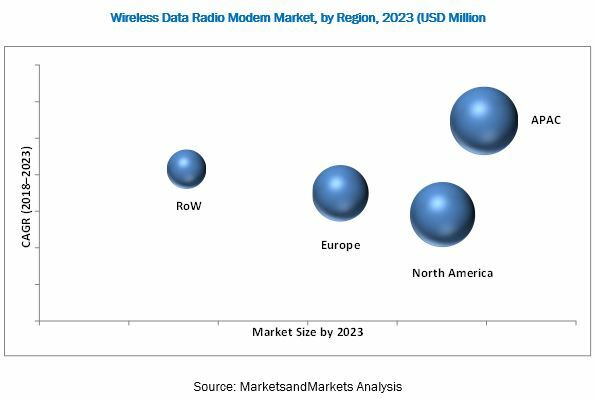 According to the forecast from MarketsandMarkets, the wireless data radio modem market is expected to reach USD 724.1 Million by 2023 from USD 594.4 Million in 2018, at a CAGR of 4.03% during the forecast period. The growth of this market is fueled by the growing demand for radio modems in agricultural drones and surveys, dominance of radio modems in SCADA and telemetry applications, and low operational costs and more power-efficiency of private radio networks using radio modems. This report covers the wireless data radio modem market segmented on the basis of product type, operating range, product type-specific application, and geography. In terms of operating range, the market for long range is expected to grow at the highest CAGR between 2018 and 2023. The long range (LoRa) technology is particularly ideal for many applications because of its long-range capability. Long-range radio modems often provide extended line-of-sight (LoS) coverage compared to higher frequency communications and are used when operators require operations over the distance larger than ultrahigh-frequency (UHF) range. General-purpose wireless data radio modem is expected to hold a larger share of the market during the forecast period. The demand for radio modems is increasing as these modems require minimal infrastructure for facilitating communication and ensuring the delivery of data, in the form of voice and video, in the most cost-effective and reliable manner. The UAV drone wireless data radio modem market for precision farming application is expected to grow at the highest CAGR during the forecast period. UAVs are a natural progression from macro- to micro-farming and large- to small-scale farms. Drones equipped with radio modems have a large number of applications in the agriculture sector, including seeding, spraying, and livestock farming. Thus, the use of radio modems operating at unlicensed UHF and VHF bands in unmanned aircraft systems have now become a valuable agricultural decision-making tool. APAC is expected to hold the largest share of the wireless data radio modem market. The rapid increase in industrialization in the emerging economies such as China and India in this region during the past several years is a major factor contributing to the growth of the market in APAC. Also, the growing capital expenditure by the governments of these developing countries in ITS, smart grid, and mining and geo-exploration is expected to propel the demand for wide area network (WAN) based on radio modems during the forecast period. Some of the restraints for the studied market are the requirement of high initial investment, and stiff competition from the alternatives such as Sigfox, LoRa, and NB–IoT. The companies that are profiled in the report are Intuicom (US), SATEL OY (Finland), Motorola Solutions (US), Schneider Electric (France), Digi International (US), Pacific Crest (US), Advantech B+B SmartWorx (US), FreeWave Technologies (US), Cohda Wireless (Australia), Campbell Scientific (US), Harris Corporation (US), Pro4 Wireless (Sweden), SIMREX Corporation (US), Wood & Douglas (UK), GE Grid Solutions (US), JAVAD GNSS (US), ABB (Switzerland), Harxon Corporation (China), Adeunis (France), ATIM Radiocommunications (France), Encom Wireless (Canada), Microhard Systems (Canada), and Arada Systems (US). *Details on Business Overview, Products Offered, SWOT Analysis, Key Customers, Recent Developments, and MnM View Might Not Be Captured in Case of Unlisted Companies.